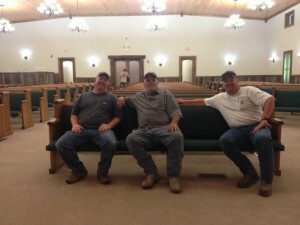 Born Again Pews has been on the road again, delivering and installing beautiful new church pews at Dyson Grove Baptist in Butler, Tennessee. The pews, a simple geometric style, complement the sanctuary beautifully. Church pews are a major factor in the appearance and comfort of a church, and these suit the style of the church and congregation perfectly. Butler is an unincorporated community in Johnson County, Tennessee, near Watauga Lake. One of the fond nicknames for Butler is “the town that wouldn’t drown.” You know, with a name like that, there’s going to be a great story. A man named John Honeycutt built himself a lean-to in what would become Butler way back in 1768. He later built a cabin, and by 1820 there were about 50 families in the neighborhood. Ezekiel Smith had built a mill, and the settlement was known as Smith’s Mill because of it. The town continued to grow, and after the Civil War it was named after Roderick Butler, a hero in the 13th Tennessee Cavalry. By 1940 the town had suffered through seven terrible floods, plus a hurricane that brought 15 inches of rain to the town and carried off houses. Damage was in the hundreds of thousands of dollars, and the Tennessee Valley Water Authority determined to build a dam that would flood Butler. Butler was the only town the Tennessee Valley Authority ever flooded. The town wouldn’t drown, though. It was relocated to higher ground in 1948 before the inundation, an enormous project that required building roads and bridges as well as relocating people. The original site of Butler, now called “Old Butler,” became visible in 1983 during a drawdown and some former residents took the opportunity to visit. Take a virtual tour of the Butler Museum to learn more about this determined town. As always, meeting the people of the church was one of the high points of our trip!